When an overhead door jams, it needs to put right fast. Time counts! Our Garaga Industrial Experts provide their TOTAL MAINTENANCE PROGRAM. To help you make the right choice for the maintenance of your commercial or industrial overhead doors, contact us. We can also provide you with a written quotation for our Preventive Maintenance Program at no charge. This maintenance program is aimed at helping you avoid emergency situations, especially for all those times you need your garage door to work faithfully. This program consists of an agreement with you to perform maintenance visits that are planned based on the frequency you use your different garage doors. Our maintenance service can be done in the form of an annual contract or at an hourly rate if it suits you better. Better safe than sorry! We have all the specialized equipment and knowledge needed to offer you quick, efficient, affordable and flexible preventive maintenance service. As well, we have a wide inventory of spare parts to ensure fast and professional service. 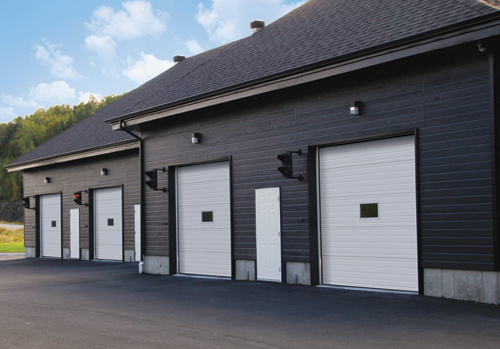 When it comes to purchasing your commercial or industrial garage doors, we will advise you on the right garage door components. The additional investment will be less than the cost of frequent repairs. Get in touch with our garage door specialists who will recommend parts and accessories perfectly suited to the intended use you make of your garage doors. Finally, doing preventive maintenance can save you money. Remember, an ounce of prevention is worth a pound of cure! Contact one of our commercial and industrial garage sales representatives.